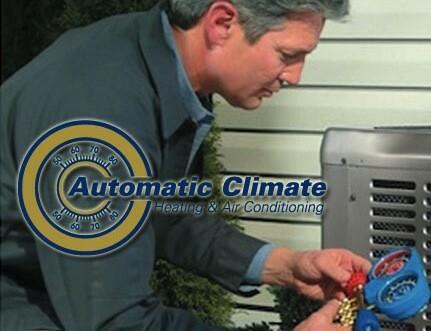 Trust the Pros at Automatic Climate for Your HVAC New Installation or Change-Out Estimate. Schedule an HVAC Service, Repair or Estimate today. Fill out the form below to request an appointment with Automatic Climate Heating & Air Conditioning. One of our customer service representatives will contact you shortly to confirm your appointment. Dependable, trustworthy, informed techs, pleasant office staff as well to work with. The quality of work. Also the professional treatment. Everyone I have had do the service has been very nice. It was the most thorough service any technician has ever done! I have had three or four different technicians over the years and they all have been polite and seem to know there job and what needs to be done. John was grrrrrreat! So friendly, professional, and knowledgeable. You are always prompt to answer calls, show up when you say you will, are always friendly, respectful and courteous. Polite, friendly technician who seemed to be very knowledgeable. It was everything I could have wanted from a service company, I was very pleased. Everybody did a very good job. Mike was the sales rep and did a good job, explained things well, good presentation. Will gladly recommend your company and its people. Air ducts vacuumed. Vent grills cleaned. HVAC return vacuumed. Entire system sanitized. 5 Reasons to Choose Automatic Climate! I have had three or four different technicians over the years and they all have been polite and seem to know there job and what needs to be done. The technician did give me some bad news. The compressor on the heat pump is not operating so I need a new heat pump. I think we purchased the unit from Automatic Climate Control in 1995 or 1996. In 2012 I had some remodeling done the heat pump was leaking water on the floor. It seems the flooring people broke a drain tube when they replaced the flooring. Your people came out and fixed the issue at no charge and they did not point a finger at the flooring people (but I did get it out of them how it could have started leaking). You are always prompt to answer calls, show up when you say you will, are always friendly, respectful and courteous. Every technician who has come out on a service call has been extremely careful and respectful of my home and me. They are quite patient, and never condescending when I have questions or misunderstand how the system functions. A breath of fresh air in a time when great customer service is hard to come by. Thank you! Everybody did a very good job. Mike was the sales rep and did a good job, explained things well, good presentation. I may have some names mistaken but everyone did a good job and were comfortable in explaining thing as they went along. Chris as technician came out prior to size things up, installer Chris and Roger were good and professional. Roger came back and did the duct cleaning well. Also we had the electrical panel replaced prior to the unit put in. We had a concern about it and had a response answered timely and are satisfied. Checking with several competitors the price was very fair, warranties excellent and professionalism very good. My wife and I are very happy with the York unit we have purchased and feel very comfortable with the air quality in the house. Will gladly recommend your company and its people.